The mirror of sky wasn't as renowned by the world . If anyone could have shown us any of these pictures, we would make all efforts to go there! Today, we finally fulfilled this dream! It's been a while that we are so deeply touched by a place. We have been to many places and posted photos that you "like", but if you go to some of these places, you will find out a lot of cheating behind the scene...e.g. the reflection of Ankot Wat is on a dirty pool of water, the wooden jetty at Nan Sheng Wai is just besides a bunch of abondon grass. Is this a dream? Or is this reality? Make a full 360 degree turn, all you see is sky fused with land. I felt like I am at the set up in the Jim Carrey's the Truman show. I imagine that if I keep walking, I will touch the edge of the giant dome, and realize that everything is unreal! There is no hidden holes, you don't feel disturbed by other tourists because there are only 2 jeeps in the whole area. You cannot have bother me more, it's in fact quite hard to wave anyone over. Standing in this land of no border between the sky and the ground, the feeling is beyond words...human beings are so tiny, and nature dominates, and for God's sake, this is real! I am deeply touched when I see it with my own eyes! This vast highland was uplifted when Andes was formed. The highland that was formed also contained a few fresh water and salt water lakes. The giant salt water lake went through several transformations during the last 30-50 thousand years and eventually dried up , resulting in two salt flats and some smaller lakes. 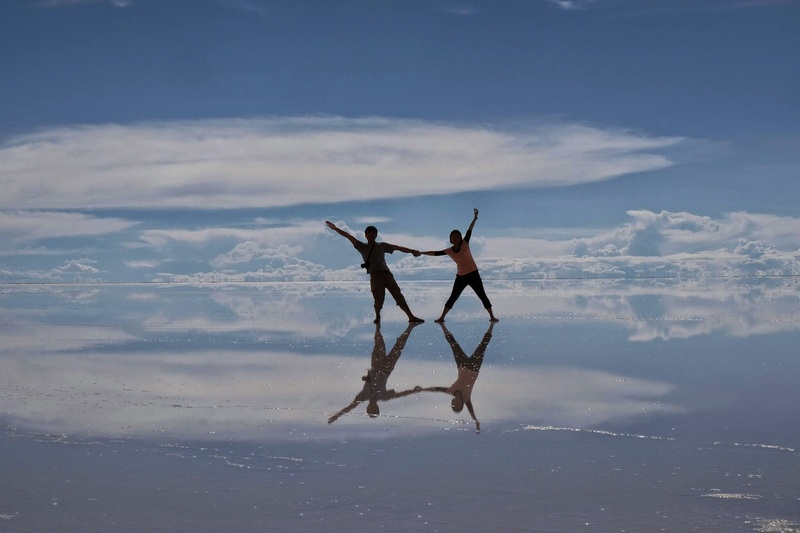 The Uyuni salt flat, 10 times of the size of Hong Kong, is one of them. The name "mirror of sky" cannot be more accurate. The salt flat is as flat as a mirror, only one meter difference throughout. She is white as snow, defectless, and a network of hexagons were formed on the white surface as a result of slow evaporation of water from the flat salt crust surface...I don't think human is capable of creating such! Because it is so flat and so white, when it is wet, it reflects everything perfectly. You simply cannot tell the sky and the ground. The perfect fusion of sky and ground is unique! Every year, during the rainy season from December till February, the salt flat is wet and is also the prettiest season to visit. But, if you think the water on the surface is rainfall, that is not quite so....the salt flat was a result of a huge lake dried up, but the resulting lakes are still connected. The salt flat also isn't entirely solid salt. Beneath the salt crust which is about several meters thick is saturated liquid containing minerals. During the rainy season, water overflows from Lake Titicaca and all the lakes in the region results in higher water levels. The Uyuni salt flat therefore is also wet. Just a few centimetres of water, coupled with the flatness and snow white colour of the salt flat, creates this incredibly dreamlike scenery! !